Spring is here! This means it's time to spring clean your home effectively. An important step in this process is decluttering, so you're only left with things that you actually want, use, and need in your home. To learn how you can go through this overwhelming task, read and follow the tips mentioned in the post below. If you need help deep cleaning your home, or if it requires professional property restoration in Richmond, VA, call Walker & Frick Construction Co. at 804 282 128. The first step in the decluttering process is to basically do a recon job. This is because, if you've lived in one place for a few years, chances are that you're not even aware of everything you own. People tend to accumulate all kinds of stuff in their homes (between things you actually need/use, clutter, garbage, things you forgot about, and more). To go through this recon job, you will need to inspect every single room in your home. Not only that, but it's necessary that you look through every drawer, shelf, cabinet, closet, and any other spot where you keep random stuff and clutter (e.g. the garage is commonly used for that purpose). If you need any help taking everything out, turn to your family members or a few of your close friends, so this daunting task doesn't seem as overwhelming. It's also recommended that you keep a notebook and pen with you, so can take note of what you need to repurchase/restock, what needs to get fixed, etc. By now, you are more aware of everything you have in your home, so it's time to take another step in the decluttering process: deciding what stays and what goes. To make this decision easier on you, you will have to ask yourself some questions regarding every belonging you have at home. For example, you can ask: do I have use for this, does this make me happy, is it expired, do I still wear this, when did I use it last, does this work, would I buy it again if I saw it in the store, among other similar questions. These will give you a better idea of what you actually need and want to continue keeping in your home. Once again, it's recommended that you turn to others for help, especially if you're finding it difficult to part ways with some of your things. An external person will be able to give you a more objective perspective, which can move the process along. If you need help to keep your home good as new, know that Walker & Frick Construction Co. can provide professional property restoration in Richmond, VA. Call at 804 282 128 to get a free estimate today. After you answered the questions in the previous step, it's likely that you already know what you want to keep in your space and what you definitely don't. To make this part of the process more organized, you should categorize your stuff into different piles. 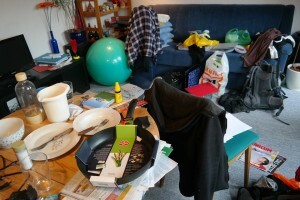 The first pile should contain everything that you want and need to have in your home (i.e. these are the items that passed the test). In another spot, you can gather the things you want to take, but that need to be repaired in some way (for example, a lamp with frayed wires). Just be sure to fix those items promptly so they don't turn into junk again. Then, have a pile for things you wish to donate to charity or give to friends/family. These should be things in good condition but that you don't get much use of. If you want, you can even create a pile with things to sell. A yard sale can help you cover some of the expenses of maintaining your home in proper condition. Lastly, make a pile with things that are completely useless, in bad shape, expired, or that can't be salvaged, and throw it directly in the trash. We've finally reached the last step in the decluttering process. Now that you're only left with the things you want, it's time to start organizing them. Before you do that, however, be sure to clean every surface. For instance, before putting the plates back in the cabinets, wipe the dishes and the cabinets down, so you can keep your home completely clean and spotless. Not only will you have to organize your belongings, but you should keep up with your organization system, so come next spring, you don't have such a hard time spring cleaning.